Applying XJZ louvre - namely the external cover for L-shaped combination window contributes to reduction of direct solar radiation on the glass of the L-shaped window, effectively reducing room interior temperature during hot summer days. The louvre eliminates the blinding effect of sun without restricting view to the outside. 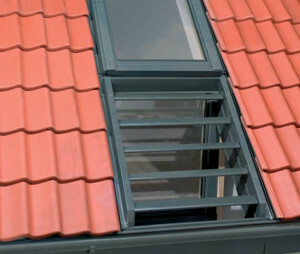 Besides the protection against the solar radiation, the XJZ louvre ensures an aesthetically pleasing effect after installing roof guttering below the L-shaped window, thus the installation of additional stop end outlets is not necessary. The louvre ensures continuity of the roof line, which is particularly important when several L-shaped combinations are applied. Slats of the shutter are mounted to the side boards through masking profile of the L-shaped window’s flashing. 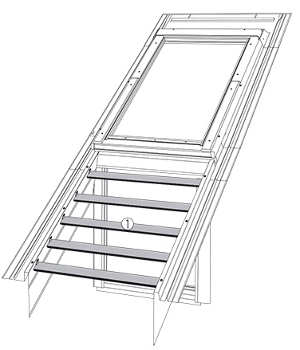 The inclination angle of the slats is set permanently at the stage of assembly. The XJZ louvre consists of six aluminium profiles painted in RAL 7022 (grey brown) the same as window profiles, and installation brackets. The cross cut of the profile’s shape is similar to the flattened ellipse (9cm in width and maximum 2.5cm in height). The profile’s length as standard is adapted to a single window width. In case of L-shaped windows installation in combinations, the XJZ louvre is adapted to a given combination width.